The liberal group in the European Parliament has rejected a request from Italy's powerful anti-establishment Five Star Movement (M5S) to join it in a new alliance to push for EU reform. Liberal ALDE leader Guy Verhofstadt said "there is insufficient common ground" to join forces with M5S. Earlier M5S members voted to leave their current alliance with the UK Independence Party (UKIP). That could weaken UKIP's parliamentary influence. M5S was also rebuffed by Green MEPs. 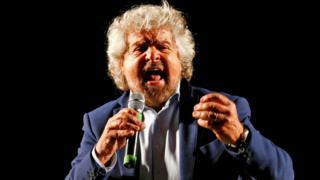 M5S founder Beppe Grillo - previously a comedian - said the snub by ALDE was a move by "the establishment", preventing his party from having greater influence. In a blog post (in Italian), he said: "All possible forces moved against us. We shook the system like never before." But M5S "will continue its work to create an independent political group for the next European legislature: the DDM (Direct Democracy Movement)", he pledged. Being in a parliamentary group brings more EU funding and influence to a party than being non-aligned. Unlike the liberal group, M5S is anti-euro and wants Italy to hold a referendum on whether to keep the single currency. Mr Grillo often criticises the way the EU is run. Mr Verhofstadt, a veteran campaigner for deeper EU integration, said "there remain fundamental differences on key European issues" between ALDE and M5S. His decision means ALDE loses the chance of becoming the third-biggest group in the parliament. UKIP's Nigel Farage voiced satisfaction over the ALDE snub, saying "I didn't expect to be proved correct so quickly". Earlier he had called Five Star's approach to ALDE "completely illogical". UKIP's group - Europe of Freedom and Direct Democracy (EFDD) - will be much weakened if the Italian MEPs leave. EFDD has 44 seats in total, including 20 UKIP members and 17 from M5S. The M5S vote to join ALDE on Monday was 78.5% in favour - that is, 31,914 votes. The party believes profoundly in deciding policy through direct online voting by its members. Earlier, Mr Grillo argued that with Brexit looming, UKIP would be focused on "the political future of the UK" and British MEPs would not be in the parliament after the 2019 European elections. He said M5S and UKIP had voted the same way in no more than 20% of cases. Despite the ALDE snub, it agreed on a joint blueprint for fundamental EU reform with M5S last week. Both oppose the "grand coalition" that dominates the EU institutions: the centre-right European People's Party (EPP) and centre-left Socialists and Democrats (S&D). Those two blocs got €17.4m (£15m; $18m) and €15.3m in EU funding last year, respectively. ALDE got €5.7m in EU funding and the EFDD got €3.8m. The ALDE-M5S blueprint says both agree that the EU of today "is unable to deliver the results that citizens expect in terms of prosperity and protection". "We need to make the European Union the global champion of civil liberties, fundamental rights and the rule of law," they say. They also agree that the euro's "underlying flaws" must be fixed. And both call for "a more democratic and transparent" EU.